Kawakami Hiromi’s novel Manazuru, translated by Michael Emmerich and published in 2010 by Counterpoint, is a strange, dreamlike story told from the perspective of an otherworldly and unreliable narrator. Manazuru is about pain and bitterness, and broken hearts and broken families. 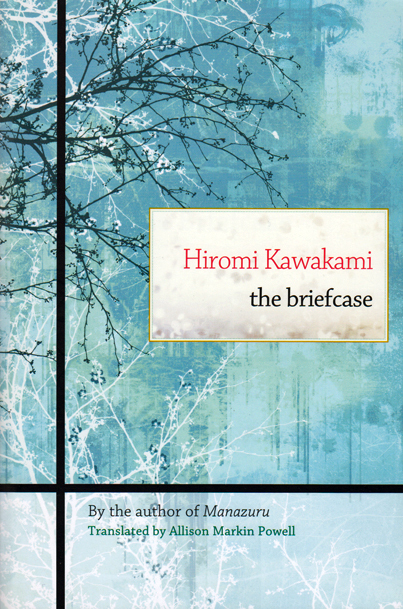 Kawakami’s newest novel in translation, The Briefcase, is a far cry from the atmospheric surrealism of Manazuru. Its narrator, Ōmachi Tsukiko, is a single woman in her late thirties who is firmly grounded in reality. The Briefcase is about her daily life and centers around her encounters with her former Classics teacher, Matsumoto Harutsuna, whom she still refers to as “Sensei.” Two decades after graduating from high school, Tsukiko meets Sensei by chance at a neighborhood bar, and the two strike up an easy friendship. Each of the ten-page chapters in The Briefcase details an episode in this friendship, such as a trip to an outdoor market or a mushroom hunting excursion with the owner of the bar Tsukiko and Sensei frequent. Seasons change, but not much else does. Nothing particularly dramatic or unexpected happens throughout the large majority of The Briefcase, and the novel’s close attention to detail provides much of its charm. At some point, sitting beside Sensei, I began to notice the heat that radiated from his body. Through his starched shirt, there came a sense of Sensei. A feeling of nostalgia. This sense of Sensei retained the shape of him. It was dignified, yet tender, like Sensei. Even now, I could never quite get a holf on this sense – I would try to capture it, but the sense escaped me. Just when I thought it was gone, though, it would cozy back up to me. The quiet normalcy of The Briefcase is satisfying in and of itself, yet there are some disturbing undercurrents running through the novel. Why is Tsukiko alone? Why is Sensei alone? What happened to him? Why does he always carry around his briefcase? These uncertainties serve to make the story more intriguing, however, and don’t escalate into a full-blown crisis until the very end of the novel, when Tsukiko undergoes a startlingly surreal experience. During two of the final chapters of the novel, Tsukiko’s feelings for Sensei, as well as her fear of his rejection, are explored in a strange sequence titled “The Tidal Flat – Dream,” which may or may not have actually happen. This chapter is a unexpected break from the regular mundane atmosphere of The Briefcase, but it pulls the novel together thematically in a creative and unexpected way. Daikon, tsumire, and beef tendons, please, Sensei ordered. Not to be outdone, I followed with Chikuwabu, konnyaku noodles, and I’ll also have some daikon. The young man next to us asked for kombu and hanpen. …are not uncommon. It’s an interesting style of translation that emphasizes the novel’s focus on peaceful daily life in a richly detailed environment, and it’s fun to read. The culturally specific words scattered throughout the text can be largely ignored if you’re not feeling up for a hyperlinked adventure on Google, though, so they shouldn’t be distracting for the reader. The Briefcase is a gentle and quiet novel that’s enjoyable both for its story and for its atmosphere, and it’s much more accessible than Manazuru (which is not to say that Manazuru is bad, just very weird). It’s literature that doesn’t take itself too seriously, and I very much enjoyed reading it. I wonder why they publish these books only after 10 years. It takes me nearly 1 year to translate a book from Japanese into Italian, surely not 10 years… the content of these books are obsolete, now. Good writing is never obsolete. What do you mean by that? Is Powell American or British? What I mean is that, in a book that uses the orthography and idiom of American English, an occasional stray Britishism can feel out of place – so much so that I actually thought they were weird typos before a friend of mine alerted me to the fact that expressions such as “don’t let’s” are common in certain dialects of British English. I don’t know whether Powell is American or British, but I don’t think it matters in the least. From what I can find, she’s probably American (based in New York). It could be that she was using a different construction to convey an unusual grammatical choice in the original Japanese (not that I would ever be able to check that!). I’m surprised that you don’t think it matters – one of the depressing parts of reading J-Lit for me is that virtually everything has been translated into American English. It doesn’t always affect things too much, but it can have the effect of distorting the text further, adding another filter to the meaning. It’s especially bad with dialogue in some cases (Banana Yoshimoto’s books being a case in point…). The reality is that I much prefer British translations to American ones, whatever the original language. I think that perhaps the nationality of the translator does not matter as much as the nationality of the publishing company. Many translations that appear in Britain but not in America, or translations that appear first in Britain and only later in America, are translated by Americans (or, in any case, by people who are not British). I hear you about Yoshimoto Banana, though. I also feel bad for British manga fans, who have to deal with colloquial American translations without any editing at all. Thanks for the review! I have this book, and am now even more itching to get around to reading it. I’ll also be interested to see what you consider “out-of-place”. Ninety-five percent of translations from Japanese I have read tend to favour American English. While many of these are carefully considered and fairly neutral in their use of colloquialisms, some I have read are so grating it strips out the sense of Japaneseness altogether. I’ve yet to see an English translator do the same. In my experience with Japanese translations, American editions use American idioms and orthography, and British editions use British idioms and orthography – although sometimes an American translation won’t be edited at all in its British edition. Expressions that I felt were out of place were small things that, idiomatically, made no sense, especially when compared to the overall lucidity of Powell’s translation. An example early in the book (on page three) would be “The tatami room gave on to a garden” (instead of “The tatami room looked out over a garden,” or “The tatami room faced a garden,” or something). “Gave on” is grating to my ears, but a British colleague of mine says it’s perfectly normal. But who knows. I’m not British, and my friend is not a linguist. Perhaps expressions like this aren’t Britishisms but rather the translator’s own personal quirks that the editor decided should stay in the text. Yes, I think “looked out over” is more neutral than “gave on”. Personally, I think I could handle any of those subtle variations of English. So hopefully I won’t even notice when I read this book that you have so kindly reviewed for us. I red it in french last summer and it was a wonderful !